I made this first birthday cake for my niece, Valentina. Her mom (my sister) looked around the web for some ideas for this cake. She filled my phone with all types of cakes; it was overdone. As a creative baker I just like to let my imagination flow, so I decided to decorate the cake as if it were a ballet dress. I used three different pink colors for the first layer. The second layer was made with everyone’s favorite… chocolate. Yay! The day I baked the cake it was hot and wet, so I put it in the freezer. That was a big mistake. It looked like the cake had gone to the gym. It was all sweaty. “OMG,” I said! I cleaned the water with a napkin and at the end it looked shiny. I also surrounded the cake with matching cupcakes topped with Vs for Valentina. My favorite part of the day was when my niece looked at the cake and she jumped onto it, took a big bite and smiled! 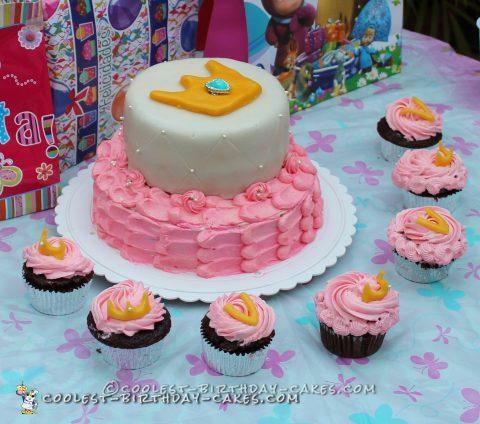 It was the first time she ate chocolate, buttercream, and fondant. I think she really loved it. That made my day.